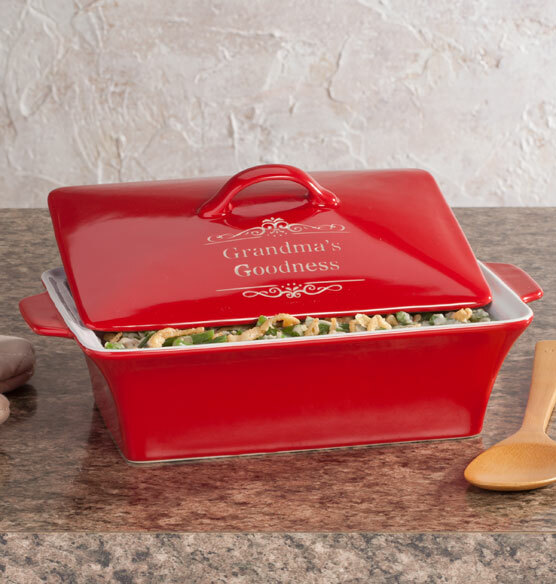 Whip up a special casserole, lasagna or other family favorite in this personalized red lidded rectangular baking dish. Perfect for baking, serving and storing meals, this dish comes with a lid and two handles for easy transport in and out of the oven. The ceramic baking dish heats evenly for delicious results and easy cleanup, and the vivid red color adds a cheerful pop of color to the kitchen. This personalized casserole dish makes a great gift idea, even better when given filled with a delicious meal. Is it possible to get a replacement lid, nonengraved? If so, what is the cost? BEST ANSWER: Thank you for your question. We are unable to send just the lid from this baking dish. We apologize for any inconvenience. BEST ANSWER: Thank you for your question. It is 7"L x 9"W x 2 3/4"H. We hope this information will be of help to you.